My city of Albany, N.Y., is currently going through a rezoning process. Mostly this entails cleaning up a fragmented, inconsistent code that hasn't really been overhauled in 50 years to make things more consistent, understandable, and up-to-date, which should go a long way toward making development and redevelopment, as well as home improvement, easier. 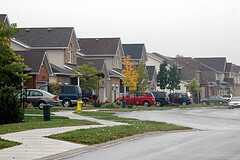 When I went to a recent presentation by one of the consultants working on the plan, I was struck by how delicate he and the city's director planning felt they needed to be to tiptoe around the suggestion, obvious to most of us who live here, that it might not make sense to keep two-family zoning in areas where the built environment includes very high numbers of three-family homes. Similarly, the consultant was at great pains (and I think he did a great job), to explain how allowing accessory dwelling units in single-family zoned areas has never caused anyone any problems where it has been implemented. And yet, he added, that they are generally not allowed in the wealthiest neighborhoods, which was a shame since they tended to have the most space to accommodate them. The inevitability that he accorded to the weathy neighborhoods' NIMBY power on such a small, no-downside thing made me deeply sad. I went home and wrote a newspaper column calling on Albany to prove him wrong and allow accessory dwelling units across all the city's single-family zones, regardless of income or lot size. I'll let you know how that goes. But in the meantime, Seattle's Housing Affordability and Livability Advisory (HALA) Committee has called for something so much bolder. “Approximately 65 percent of Seattle’s land — not just its residential land, but all its land — is zoned single-family, severely constraining how much the city can increase housing supply,” the draft says. Planners often speak about “maintaining the character of single-family neighborhoods” with the sort of devotion reserved for violent gods who punish transgressions swiftly and with vindictiveness. So it's no surprise that the group is already back-tracking on these comments, and even supporters are predicting they'll never get past The Homeowners. But the fact that they raised the topic at all is impressive. That they acknowledged the troublesome roots of current zoning is both brave and essential. If large-lot zoning in the suburbs is exclusionary, it can be, and is, argued that massive swaths of single-family zoning in a very popular urban center is as well. For my money, I'd want any upzoning in a market like that to come with stringent inclusionary housing requirements though, so that the promise of affordability was actually realized in a way that merely increasing density is unlikely to do when demand is so high. What do you think? Is zoning a good way to address affordability? Miriam — The short answer to your question: absolutely. In Massachusetts, we think our restrictive zoning is at the root of much of our housing problem. See MHP’s Unlocking the Commonwealth report at http://www.mhp.net/vision/news.php?page_function=detail&mhp_news_id=573 for our ideas to how to get at this problem in Massachusetts. Yes, inclusionary zoning ordinances are an important mechanism for capturing part of the value created by public infrastructure and other amenities for the benefit of the community. These policies should also require that all housing created through these kinds of programs is permanently affordable to ensure diverse and equitable communities. Seattle’s Housing Affordability and Livability Agenda (HALA) includes the recommendation of a commercial linkage fee and a mandatory residential inclusionary zoning program. The City Council plans to adopt a commercial linkage fee ordinance later this year while the full inclusionary housing recommendation is expected to be implemented no later than September, 2017. I appreciate learning about Seattle’s new zoning recommendations through your post, and am refreshed to learn that a city committee is willing to step up and call out how its zoning ordinances grew out of ‘racial and class exclusion’. I’m curious to learn more about how their recommendations actually respond to this recognition of historical racism and classism. In response to your question of upzoning and inclusionary housing requirements, I feel that it is a complicated issue, and I am coming from the context of the SF Bay Area. Here, I am more acquainted with the perspective that inclusionary zoning (IZ) is a tool that plays more in favor of developers and pro-development folks (e.g. market-rate developers) who wish to push for more development within fully built-out cities, such as San Francisco, in order to cash in on the lucrative real-estate boom that is happening here. So while IZ might look like a decent strategy on the surface, I’m of the critique that IZ has been used by developers (and cities wanting to profit off of high-end development) to generate the illusion of due diligence of bringing ‘community benefits’ so that market-rate developments can be approved. Even if affordable units are provided in these new developments, and in some cases they actually aren’t since developers are opting more and more to pay into an ‘affordable housing fund’ instead of actually providing units on site, the equation of determining the prices of these affordable units based on AMI generally neutralizes IZ’s original intent because the areas they are built in are already highly gentrified areas. Additionally, upzoning lots that are already built out gives developers and landowners the incentive to redevelop their land, which will cause displacement of longtime residents that may be living there under rent stabilized prices. The number of ‘affordable’ units that they would provide under IZ usually has little chance of making up for the rent-controlled units that were lost.